Policymakers and pundits continue to propose Medicare changes that would have severe repercussions for beneficiaries and their families. These proposals will continue to make news as deficit discussions heat up. Too often, however, they are based on false information, which is repeated as fact by the media, pundits and policymakers. We aim to correct public misinformation about Medicare. Medicare Works. For 46 years it has opened doors to necessary care for hundreds of millions of older and disabled people, and enhanced economic security for beneficiaries and their families. Informed Americans need to know the truth about the program and the people it serves. 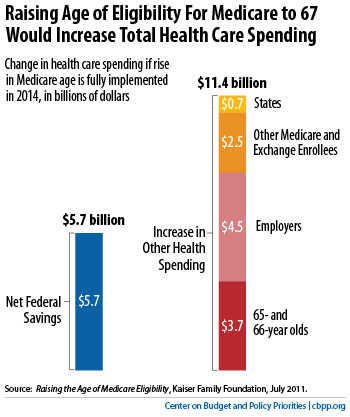 According to the Center on Budget and Policy Priorities (www.cbpp.org) that "Raising Medicare’s eligibility age from 65 to 67, which the new Joint Select Committee will likely consider this fall as a deficit-reduction measure, would not only fail to constrain health care costs across the economy; it would increase them. While this proposal would save the federal government money, it would do so by shifting costs to most of the 65- and 66-year-olds who would lose Medicare coverage, to employers that provide health coverage for their retirees, to Medicare beneficiaries, to younger people who buy insurance through the new health insurance exchanges, and to states. View the full report at: http://www.cbpp.org/cms/index.cfm?fa=view&id=3564 or http://www.cbpp.org/files/8-23-11health.pdf 7pp.